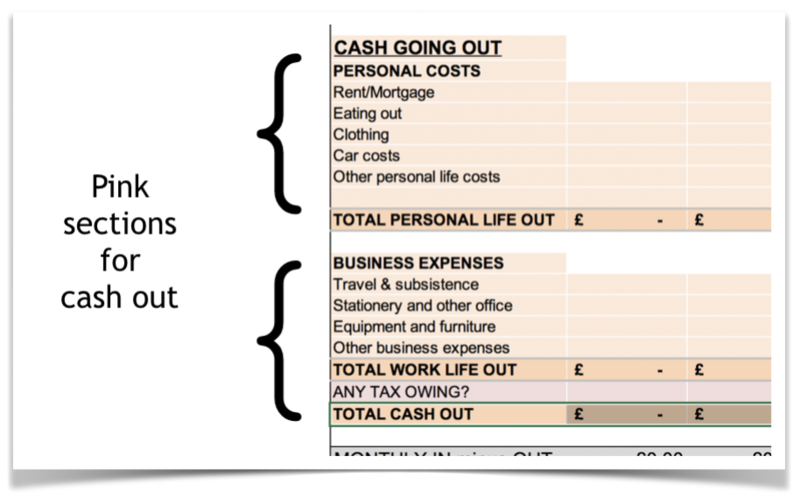 I’ve been going through cash flow planning with sole traders now for nearly 15 years, and it’s a great way to plan how to not run out of the money. A cash flow sheet for small businesses is one of the templates that trainees can download after our finance workshops. It’s still there, and it’s still the best sheet to use if you’re a sole trader or running a limited company or partnership. At long last *BIG FANFARE* I’ve devised a simplified cash flow planner which works for freelancers being paid as employees. This should be particularly useful for people starting out on their freelance career. Many freelancers now have a mixture of taxed or untaxed PAYE-type income. And some might also have a sole trader business for other types of work. Traditional cash flow sheets can’t get easily their heads around this. Most people will probably only use one of these lines, or possibly two. However I regularly meet people who have all three types of income across a tax year. The outgoings section is split into two. Spending in your personal life will be relevant to everyone. Spending on business-related bits and piece will probably only be useful to people who have some self-employed income and limited business expenses. But it can also be used by PAYE freelancers to plan spending on travel or equipment, even when not tax deductible. There’s also a line in case you need to remind yourself that you owe some tax later in the year. And the lines at the bottom? Well, that’s the bottom line. Will you run out of cash or will you have anything in the kitty? It’s a new sheet, so if you find any errors, do let me know. This spreadsheet is in Excel format. An Apple Numbers version is on its way shortly! Have been freelance for about a year now, it’s been a slow start but much more fun than commuting to an office every day. I think we covered the cashflow spreadsheet at the end of the day on the course and by that time my brain was full. I still haven’t got my head around it so am looking forward to having a go at the simplified version. Many thanks! Thanks Kate! I’m hoping this simplified sheet might be easier to cope with when the brain is full. I tried it out last week and people loved it. Good luck.